Today I have a treat for everyone: an interview with bestselling – and that’s no exaggeration – author B. V. Larson. It’s especially great for me as we’ve known each other since our teens growing up in the same little dusty California town. While I took off for a career in the military, only trying my hand at writing after I finished more than twenty years later, he kept plugging away, perfecting his craft. When the ebook revolution hit, he had a ready backlist to take quick advantage of the new technology. B. V. Larson is the bestselling author of over thirty novels, many of which have reached the Amazon’s Top 100 bestseller lists and in aggregate have sold over a million copies. 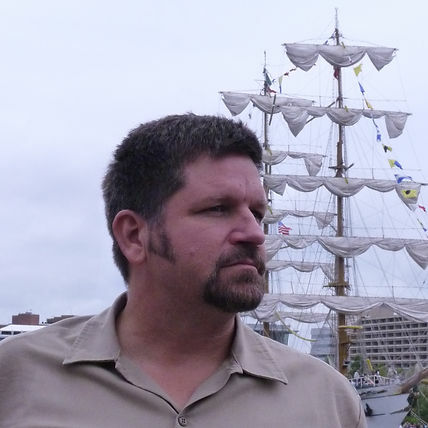 Writing in several genres, most of his work is fantastic in nature, and spans Military Science Fiction to Epic Fantasy to Paranormal Romance. As a California native, B. V. Larson’s stories often take place on sunny beaches and in cities such as Las Vegas. He lives in Central California with three kids living at home, and currently teaches college. He writes college textbooks as well as fiction. For some more bio info, here’s a video of B. V. Larson being interviewed a couple of years ago. So B, what is a typical writing day for you? I write 7 days a week for about 2 to 3 hours a day when I’m writing… which is almost always these days. I usually work in the afternoons after morning classes and before night classes (I teach college as well as write). Do you have a favorite character in one your series, aside from the lead? Probably my favorite character who is a sidekick would be Marvin from the Star Force Series. He appears first in book 3 of the series and he plays a significant role in every book after. He’s a robot that built himself with the main character’s help from scratch. He started off as an incomplete download (his mind, anyway) and he’s been trying to reconstitute himself ever since. He’s morphed over the years into a sneaky robot fascinated by life. He likes to tinker with biotic species, seeing what he can make of them. Essentially, he’s a robot nerd who has his own schemes and his own bizarre goals. He’s become my mad scientist who Star Force needs, but who constantly plagues them at the same time. Do you plot your stories or do you just get an idea and run with it? As far as what to write next goes, I keep a recorder with me at all times and record thoughts and story ideas. Later, I type them into files and organize them. I have files with literally thousands of these thoughts, which I weave together into a story when I have enough related material. So, from one standpoint a book takes me a few months to write, but from another it might take a decade or more. 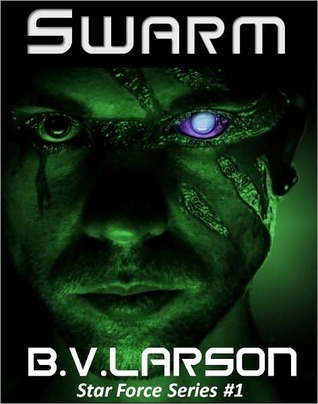 SWARM, my most successful book, was something I was thinking about and piecing together for more than a decade. When I finally wrote it, it seemed to write itself. So how is SWARM different from other sci-fi books? There are a thousand books about alien invasions. Swarm is a new twist on that theme. The aliens are capturing and cruelly testing humans, killing the weak. They are looking for someone special…for a distinct purpose. My original goal was to write about the rise of a normal man to the heights of power and responsibility. I chose to write about an alien invasion as a logical way it could happen. In this way, it is quite different from most alien invasion stories which are really about the invasion itself. SWARM is about the man caught up in it and being dragged into situations he never expected to experience. You write in various genres. What is your favorite? I wrote and sent out my first short stories at age 17, and writing is my life-long dream job. So for me, I write a lot because I’m spoiling myself. I’m also a person who is easily bored. As a kid, I was called “hyperactive” which has been updated to newer terms. This has a lot to do with my broad range of fiction. I tend to read random things, and if I like genre and get an idea, I want to write something in that genre. Sometimes, I have to stop a project, write a short story, novella or even a book, then go back to the project I’m supposed to be working on. At times, I write two books at once, because I keep thinking of ideas for both. All that said, I probably feel the most at home writing slightly horrific fantasy or slightly horrific SF. But I read and write practically everything, and I write every day. What do you hope your readers come away with after reading your books? What I want people to think goes something like this: “Wow, that was a fun, fast read! I think I’ll go have another.”I don’t like to put “messages” into my work. One might sneak in now and then, I suppose, because we all have opinions and biases. I’ve always been annoyed, however, when an author breaks my suspension of disbelief by inserting things for such a purpose, when I sense the writer is forcing a story to go a certain way just to make some private point of his/hers. Often, this ruins fiction for me. I recall playing role-playing games as a kid, and there was one game-master who controlled everything you could do in his world, rather than letting it flow and letting the players participate freely. It was incredibly irritating. I never want to foist myself in such a fashion upon my readers. If you want to put a message in, it must be done in such a way that it is intrinsic to the story; it must fit there without intruding. I figured out I wanted to become a writer at around age nineteen. It’s taken many years to learn enough to become successful, however. I’d caution young people not think their first story will take the world by storm. It might happen—but probably won’t. Like the first time a kid picks up a violin, our first writing efforts are usually painful to the ear, but with enough work, it can happen. Don’t expect immediate success. If you picked up something new, like skiing or singing opera, or playing a violin, you would probably crash and burn for years before you did anything impressive. There’s nothing different about writing. You have to put in your years of skill-building, unless you are a natural talent…and that is very rare. How do you think your audience found you and what triggered your boom in sales? I really think having a lot of inexpensive, fun, readable stories was my secret. Looking at the successful indie authors, I usually see two types of people, those with one hit book, or those with a slew of books that are doing well and help each other. I took this second, safer route. You have to have an interesting cover and title, have a subject that intrigues and do a nice free sample/book blurb. To keep selling, you have to have a good book, or the reviews will sink you even if everything else is right. One last point: make sure you never mislead your readers. They will tear you up! Many aspiring writers – I won’t say authors because they often haven’t sold anything – believe that unless someone is published by a big publisher they haven’t “made it.” Do you think that will change any time soon? I hope it takes a looooong time before they figure it out! I do think it will take a while. In 1990, cable TV was considered not “real” TV. When I got a cell phone in 1995, everybody at work made a big deal about how I was showing off. A long time ago when paperbacks came out, people sneered at them and those who wrote such trash. In Shakespeare’s time, people who went to plays were considered riff-raff—people of substance went to the opera. And so it goes. The real change will come when the money comes to the indies. When we make more than they do, we will be important by definition. In all the years you’ve been publishing your work, what is the biggest mistake you made that you could share so others can avoid making it? Hmmmm. Well, 47North offered to buy out my interest in the Haven series when it was at its peak and selling 500 or more books a day. I thought they were crazy at the time, but I should have sold out, because of course the series faded dramatically over the next six months. Now, I’m lucky to see 50 sales a day on that series. Sometimes, you have to know when to sell! You’ve had great success self-publishing. What led to you going your own way? Failure at selling fiction the traditional way drove me to Amazon. I spent over a decade sending in fiction and getting rejection letters. I did sell about 10 short stories and I have a college textbook series, but I never got a novel sale until after I became a big indie. Now, I do both. My next traditionally published book is “The Bone Triangle” and is due out in April 2013. It’s the second in the “Unspeakable Things” series that started with “Technomancer”. Where can people find your books? Thanks, B, it has been great having you with us today.